Kalakand | The Flavor Nook! 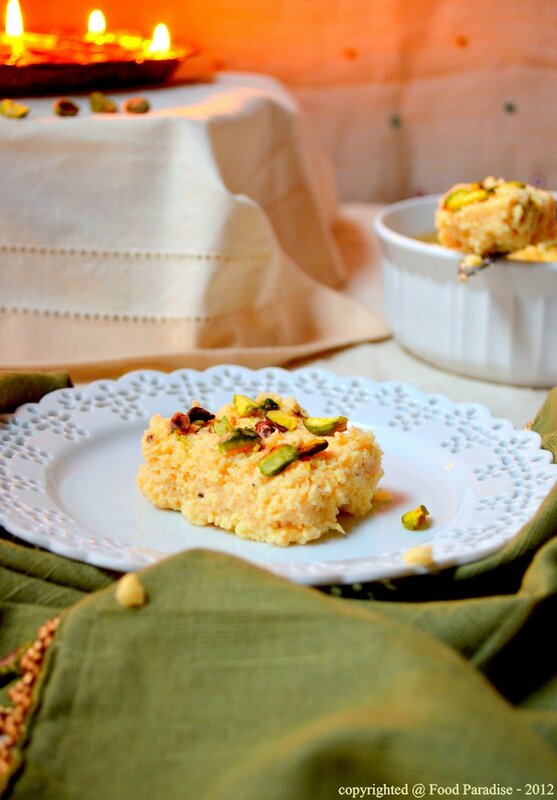 It’s ‘Diwali’ and here I am with one of my ever favorite sweets – Kalakand. I wish I could have posted this much earlier….but was really busy this weekend….and couldn’t find time to post this. 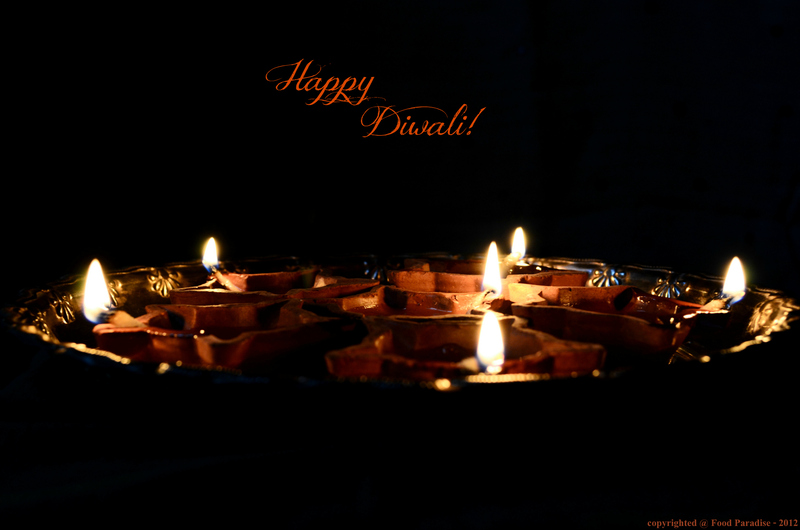 ‘Diwali‘ or ‘Deepawali‘ is the festival of lights! It is one of the most important festivals of India and is celebrated all across the country on a magnificent scale. Although it is a five day festival, we or at-least in the parts of the country I hail from give prominence to three days of the occasion The first day, is on Amavasya (no moon day) and is important to people who own businesses. Business owners worship Goddess Lakshmi – The Goddess of Wealth for a profitable business. The second day is referred to as ‘Naraka Chaturdasi’ which is celebrated due to the victory of Lord Krishna and Satyabhama over demon Naraka. The third day signifies the return of ‘Lord Rama’ and ‘Lakshmana’ after rescuing ‘Sita’ from the clutches of the demon-king of Lanka ‘Ravana’. Upon their return, the people of Ayodhya, welcomed them by lighting ‘deep’ or ‘diyas’ (traditional lamps made of clay) and bursting fire-crackers. Every year, for Diwali people clean their houses perfectly, illuminate their homes by lighting clay lamps filled with oil and firing crackers. Also, it is a tradition to keep the main doors open until late at night as it is believed that ‘Goddess Lakshmi’ will feel welcomed into the neat, sparkling homes and bestow her blessings and make the family prosperous. As with every festival, food, particularly ‘sweets’ are a significant part of ‘Diwali’. Family & friends, near & dear meet and greet one another and exchange scrumptious homemade sweets as a token of well-wishes. Back in those days at home, on the three nights of Diwali, after our early dinner, mom would arrange clay diyas in a tray and light them up and I would carefully place them at our main entrance door and on the surrounding walls. Then, me and my brother would start off with the fireworks and mom and dad would monitor us on our safety. After, our quota of fireworks for that night, we would head inside for a late-night diwali sweet treat! 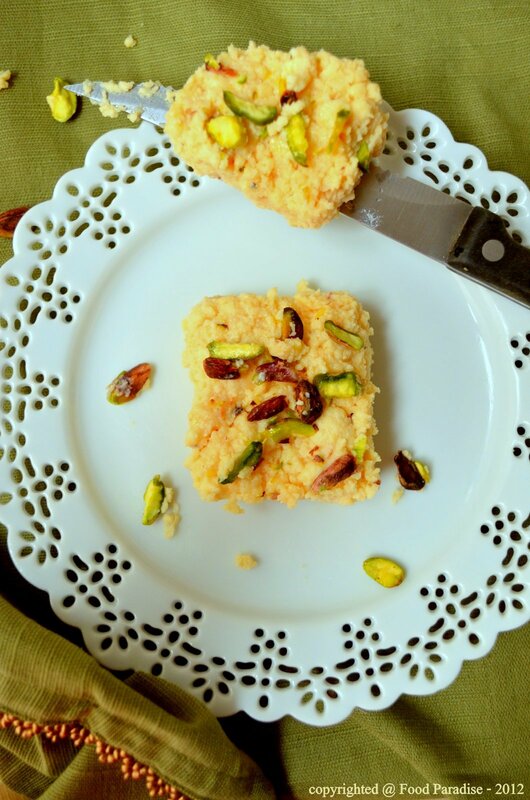 ‘Kalakand’ is a very popular Indian sweet which could be referred to a ‘sweetened milk cake’. It is one of my most favorite sweets and really screams ‘Diwali’. Don’t you think? The process of making Kalakand is two fold – make the ‘Chhena – fresh crumbly cheese’ and ‘Khoya – reduced milk’ and then cook them together until solidification! It is a time-consuming process but definitely worth the effort. 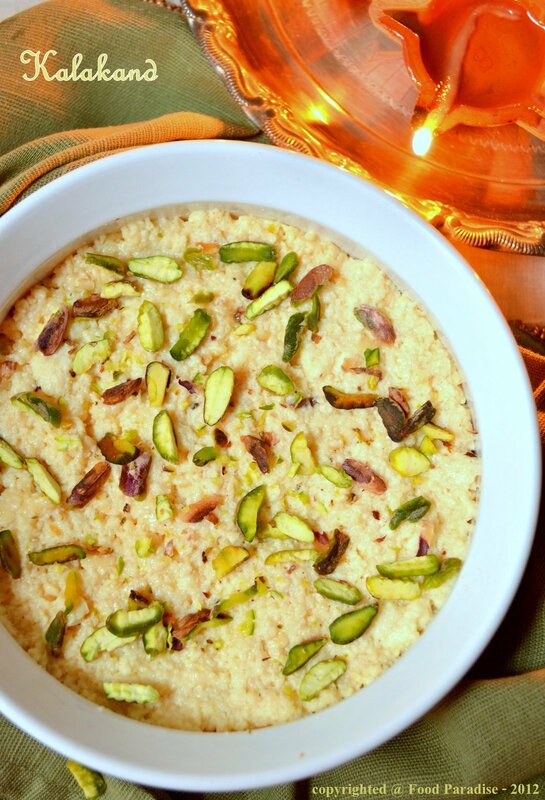 Since, Kalakand is made completely out of milk, (preferrably Whole Milk), it is definitely a rich sweet but festivals are here once a year so I think indulging once in a while in such a rich, delicious creamy and crumbly sweet is completely ok (divine)! This is adapted from one of my fav blogs ‘Mahanandi‘. Chhena is the outcome of the coagulation of milk with an acidic agent like lime, vinegar or curd/yogurt which when kneaded and devoid of much moisture is called ‘Paneer’. 1. Take a thick bottomed dish and add milk. With the stove on low-medium heat, and constant stirring, heat the milk well. 2. When the milk is just below boiling point reduce heat and add lime juice to the milk. 3. Stir well and in a few minutes the milk starts to coagulate separating from the whey. Remove from stove and let cool down for a couple of minutes. 4. Ready a colander with a cheese cloth on it. Place another dish below the colander to collect the whey which you can use in a number of other side-dishes. 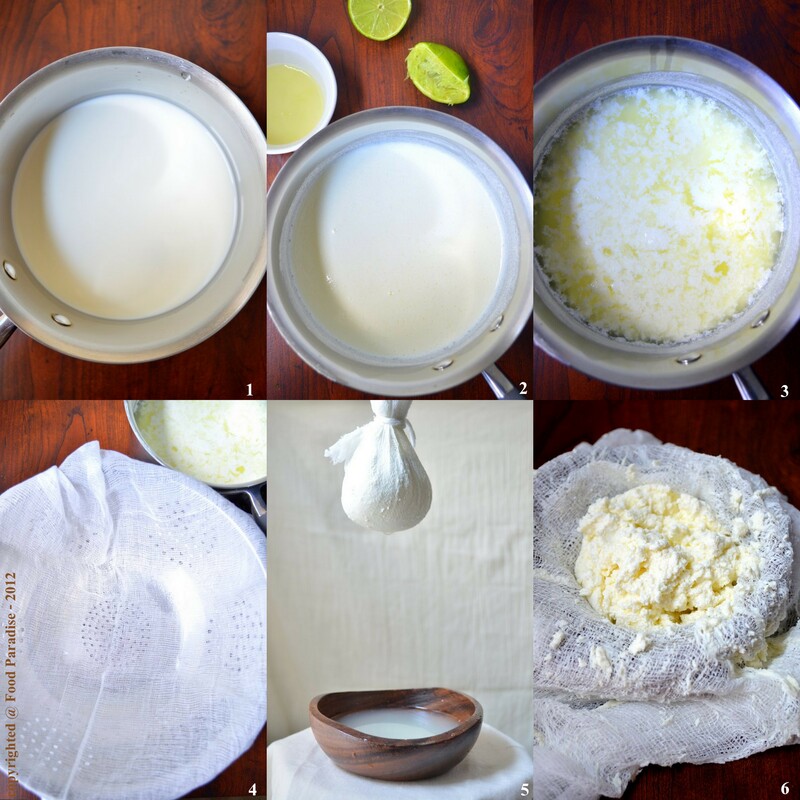 Carefully, pour the milk over the cheese cloth so that all the chhena/cheese is collected in the cloth. Run some cold water over it to remove any sour taste from the lime juice. Tightly squeeze the cheese cloth to drain out excess whey from it. 5. Tie the cheese cloth tightly and then hang it above your sink for at-least an hour so that any excess water/whey drips out. 6. Remove the cheese cloth, untie it and you’ll see nice, crumbly fresh chhena. Store in an air-tight bowl. – Instead of lime juice, you could use vinegar or yogurt/curd. Khoa is the outcome of simmering milk on low-medium heat over a long duration. It thickens and reduces the milk by a large volume and gives a nice and creamy texture and taste. 1. In a thick bottomed dish/pan, add milk. With the stove on low-medium, heat the milk slowly. Keep stirring to avoid milk from sticking at the bottom and getting burnt. 2. In about 50 minutes to 1 hour, you’ll see the milk thickens and reduces significantly to about half of it’s original quantity. – For instant Khoa, you could add milk powder to milk and then heat it until it thickens. Cooking Chhena and Khoa together and then sweetening with sugar until everything comes together is what yields this gorgeous looking and delicious tasting ‘Kalakand’. 1. When the khoa is ready but still has enough liquid and moisture in it, add the chhena. Keep the stove on low heat and stir them together. After a couple of mins add sugar, cardamom powder and stir until all the sugar melts. Keep stirring until everything comes together in a soft dough like consistency. 2. At this point, turn off the stove and pour the mixture onto a baking sheet or plate (lighlty greased with ghee). Spread evenly and let it sit for an hour or so until it nicely firms up. Then, cut into squares and serve right away or store it in air-tight containers to serve up later. 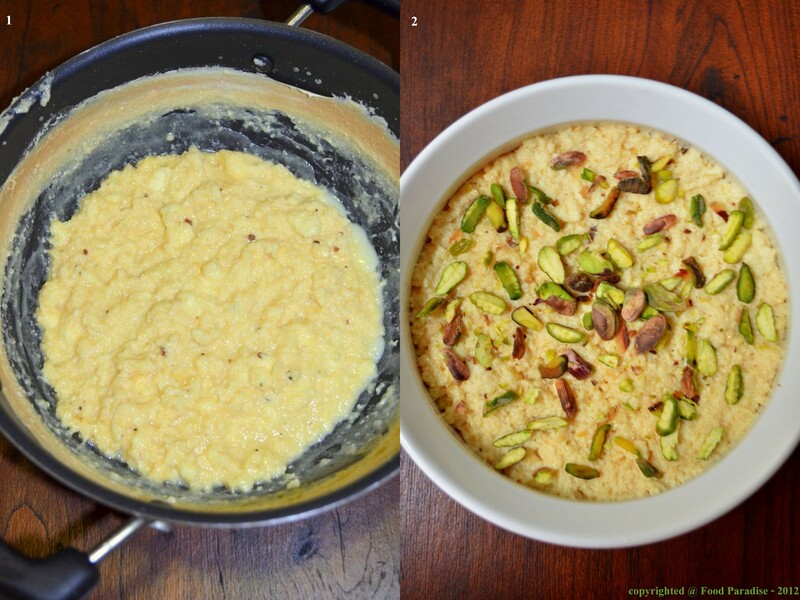 – For a much simpler and quicker version, replace ‘Chhena’ with ‘Ricotta Cheese’ and ‘Khoa’ with ‘Condensed Milk’. – This ‘from scratch’ version is very time consuming and needs a lot of patience. So, split the process and make ‘Chhena’ a day prior to making the actual sweet. – Always refrigerate left-over Kalakand as it has a tendency to spoil easily since it is made completely of milk. 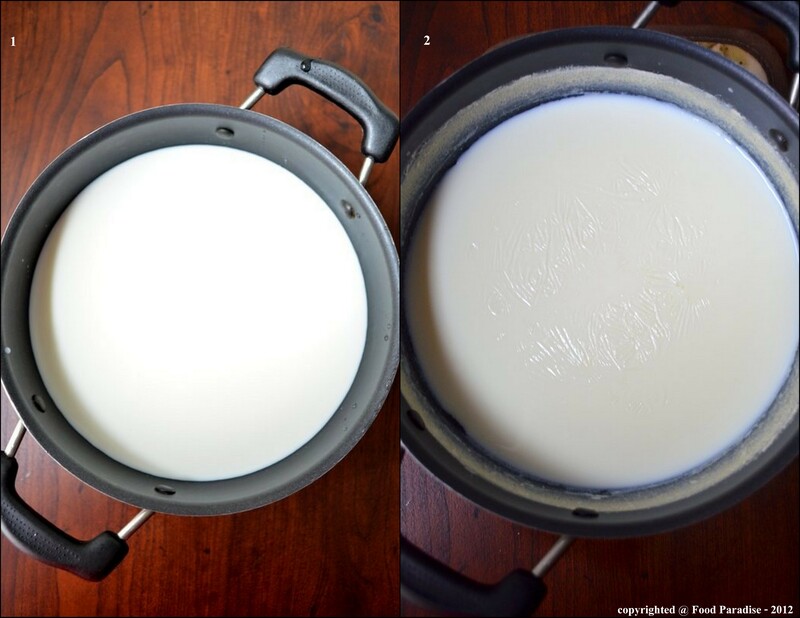 – If you don’t want milk to boil over the rim of the sauce pan or pot, place a wooden spoon across the rim. Trust me, this came out tasting like it’s straight from an authentic Indian Mithai Bhandar….you must try it out! What is your favorite sweet for Diwali? Pingback: Coconut Laddu | The Flavor Nook! Pingback: Kesar Pista Kulfi – Saffron Pistachios Ice-Cream | Food Paradise! Pingback: Lemon Coconut Custard | Food Paradise!